In 1969, Albert Doyle saw an opportunity to provide better value for businesses requiring high quality fasteners. So he began rolling parts in his garage in Detroit, MI. Soon his hard work and customer focus started paying off. Over the years the Doyle family business grew into one of the most respected cold heading manufacturers in the Midwest. 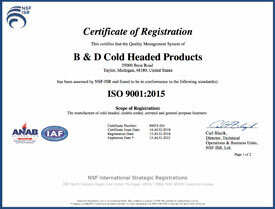 Over the decades, B & D has built long-lasting strategic partnerships with suppliers and processors and assembled a dedicated team of professionals. We continuously invest in our business systems and processes in search of value for ourselves and our customers. In 2009, we implemented Lean Manufacturing techniques in our operations passing substantial savings on to our customers. In 2012, we implemented Plex Systems which tightly integrates our manufacturing and financial systems into a single cloud-based manufacturing ERP. Over the past few years, we’ve built on this foundation continuing to add on new capabilities and product offerings. Over the decades, we’ve worked hard to maintain that energetic, customer-focused culture that built our business in the first place. Our highly skilled team can produce a part from concept to completion or finish a customer supplied part or prototype. We also offer competitively priced inventory management options. Please give us a call at (734) 728-7070 or contact us to get started.